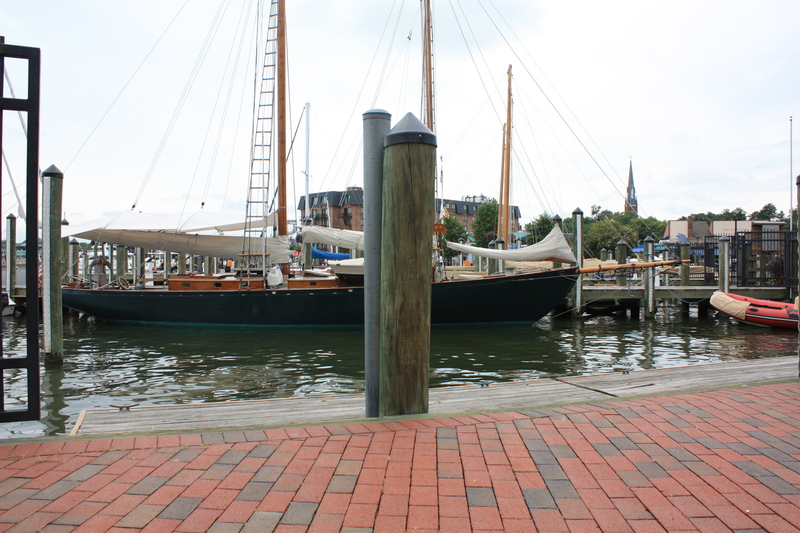 We haven’t been to Annapolis in a while, and some things have changed of course. 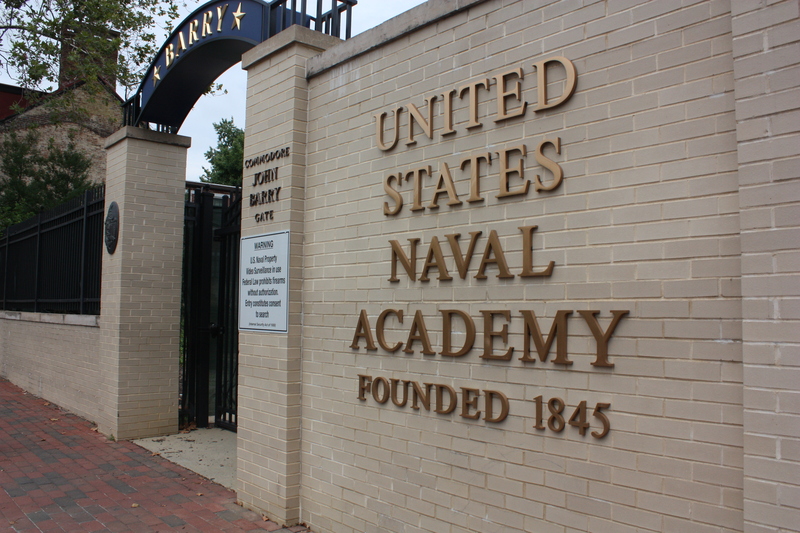 Years ago, you could walk and visit the Naval Academy with your dog without a problem. But this time, we had to wait for Cynthia to go and check if Alex could go in with us. This is Alex, patiently waiting for Cynthia. Since Cynthia always takes longer than she should doing almost anything, yes, I am complaining, Alex and I went around the neighborhood to explore and take pictures. As you can see, Alex was quite curious about this big piece of wood moving in the water. Like I said, we haven’t been to Annapolis in a while. This is what we were looking at. 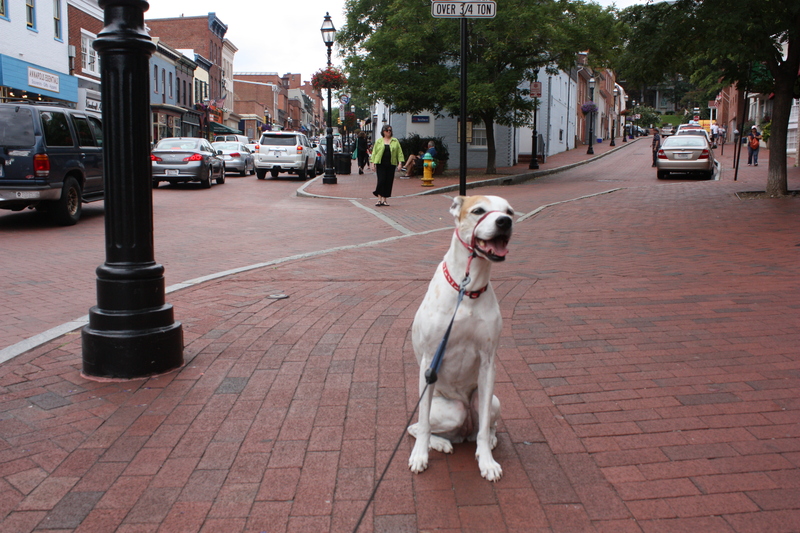 Annapolis is a really beautiful city and one worth exploring with your dog. Cynthia finally came out and told us that we could not take Alex to the Naval Academy so we decided to go around Annapolis to walk, shop, and just do some sightseeing. 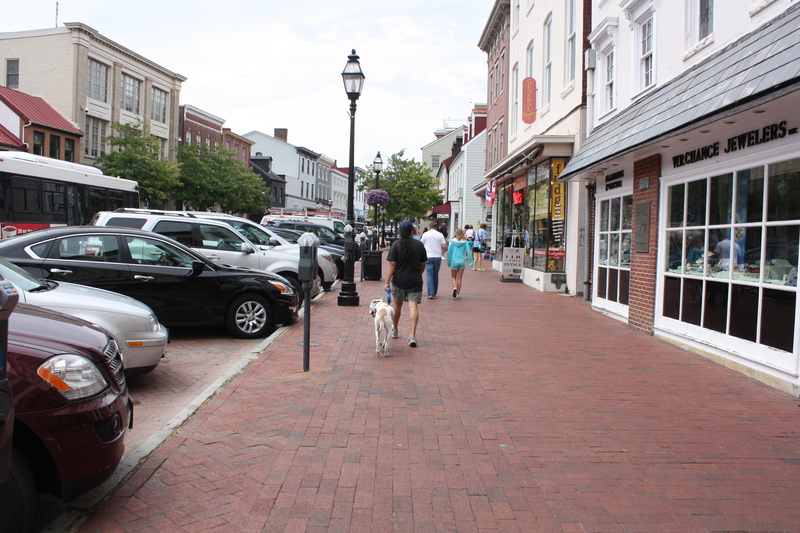 Cynthia and Alex walking in Annapolis, MD. Alex is used to cars, people, bikes, etc., that is why taking her with us is a pleasant and enjoyable experience. Even though she is used to so many things, we still take her with us whenever we can so she does not forget. All right, all right, I’ll come clean: it’s fun to walk around with her. I could not help but take a picture of this cute dog. 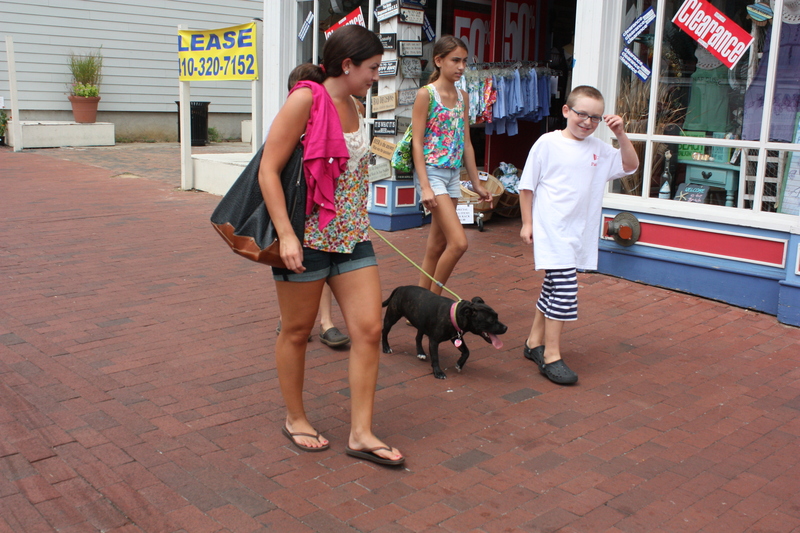 Notice how well this dog is walking even though the one holding the leash is a kid. Yes, when kids are taught how to walk a dog they do a pretty good job. I got Alex to pose for this picture by asking her to sit and stay for me. Like I’ve told many pet parents, training your dog should be something that you incorporate in your life, and this is a perfect example. Do I train Alex at home? Yes, but I do it as part of her every day routine. Before she eats, I ask her to sit. Or, if she is going to get a treat, she has to sit for me. Did I take 5-10 minutes to specifically train her? No. At the beginning, yes I had to in order to teach her what I wanted from her, but after a couple of sessions she was good to go. Walking a dog should be something that you enjoy, but you need to train your dog to do so. 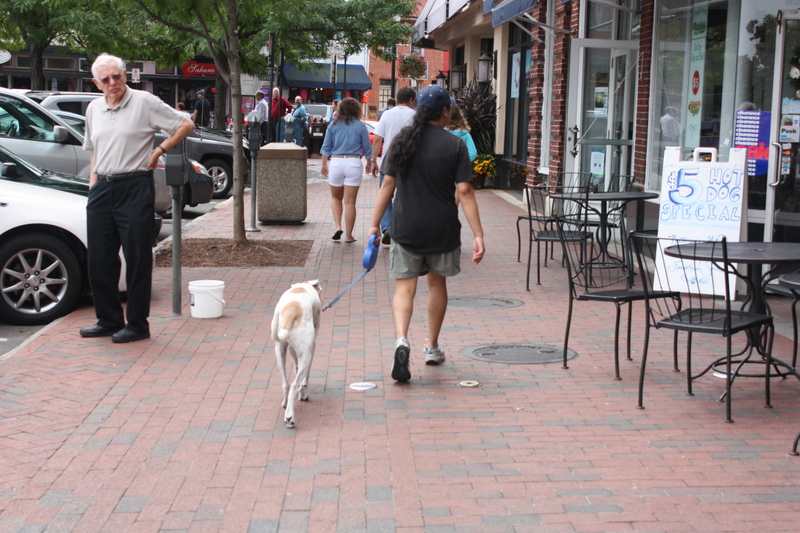 Take your dog and explore different neighborhoods. Once we got home, Alex went out like a light. 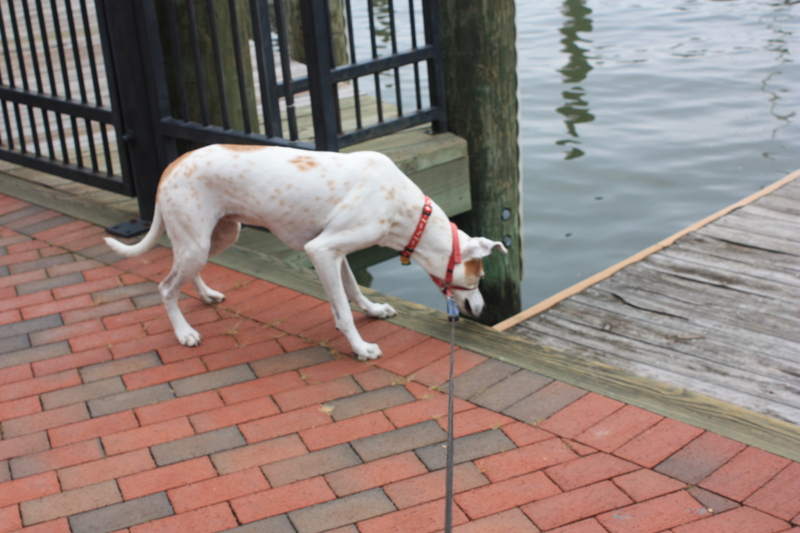 She was tired not only because of the walk, but also because of the amount of new smells she encountered while walking in Annapolis. This is a great way to fulfill your dog’s need for exercise. 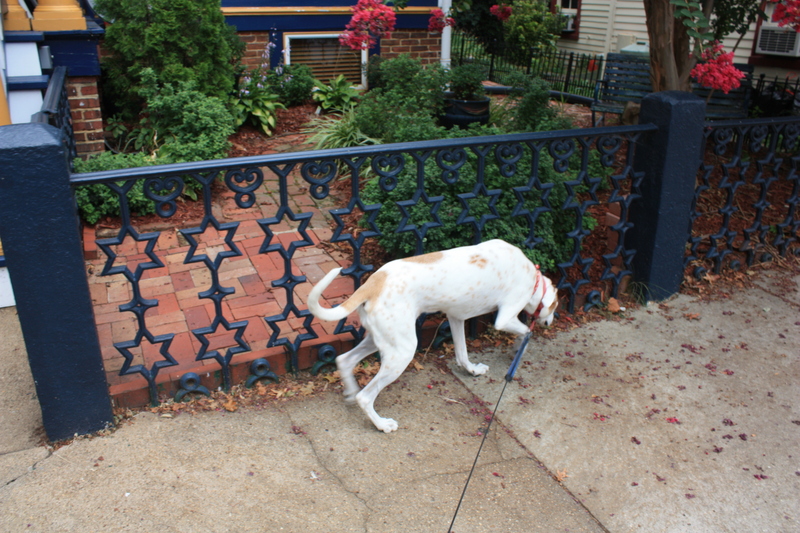 This entry was posted in Breeds, Dog Equipment, Dogs, Humor, Nutrition, Outings, Walking and tagged Annapolis Maryland, Dog, Recreation, Training, United States, United States Naval Academy, walk. Bookmark the permalink. (sits down ladylike, licks outstretched hand) I can tell you truly care about animals, and we love you too! Thank you! Woof! Alex is so well behaved! Dudley & Zoe pretended to walk patiently until they saw something they wanted to chase! Oh yes, what a pawesome day for Alex…Such fun!!!! Thanks. I think she enjoyed it. 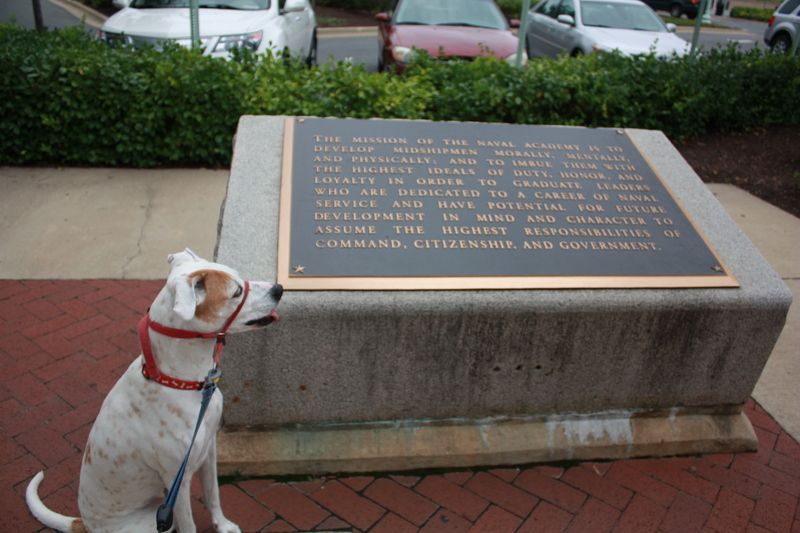 I used to live in DC and loved taking trips to Annapolis with my brother’s dog dutch. There is a great dog beach nearby as well!